I have always been somewhat disappointed with the lack of features for furnaces in Minecraft. It is such a simple mechanic, yet it could be taken so far. 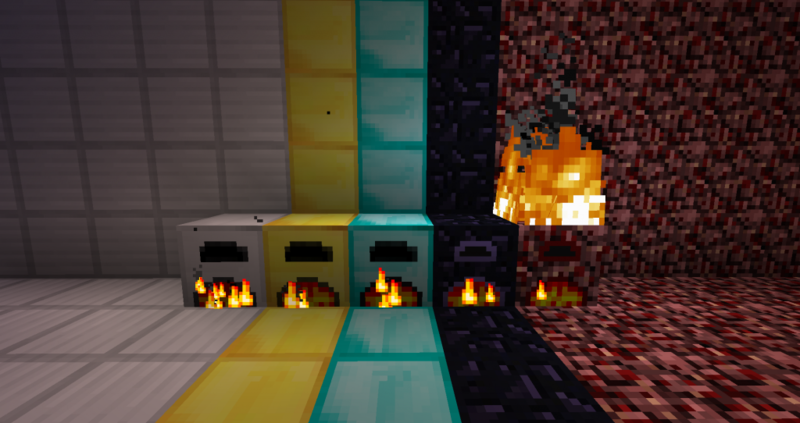 User CubeX2 has given furnaces the treatment they truly deserve, with the More Furnaces mod! Iron furnaces allow two stacks of items to be placed in the furnace at once. They still smelt one at a time, but when one runs out, the next will begin. Two fuel slots are also available, and two output slots leave space so that fuel isn’t wasted. Iron furnaces are marginally more efficient than cobblestone furnaces. Gold furnaces act the same as iron furnaces, except that they provide four total slots for input, fuel, and five slots for output. They are slightly more efficient than iron furnaces as well. Diamond furnaces, once again, are the same as gold furnaces, with seven slots for input and fuel and nine slots for output. Diamonds are extremely efficient. Obsidian furnaces are more unique; they allow two items to be smelted at once, each with two input slots and two output slots. One fuel slot fuels both items, effectively doubling its efficiency over cobblestone furnaces (though still far from diamond’s). Netherrack furnaces are, on paper, the most efficient of all – they require no fuel! Simply set the top on fire with flint and steel and it will burn for eternity (unless extinguished), smelting or cooking anything inside. However, it is extremely slow – this furnace is only recommended if you are low on resources or prefer to utilize them for something else. Netherrack furnaces are crafted by surrounding a cobblestone furnace with netherrack. As you can see, a diamond furnace costs a total of eight iron, eight gold, and eight diamonds – but it is well worth the cost. Download the latest version of More Furnaces from Curse Forge. Drag and drop the .jar file downloaded in step 2 into this folder. What other new types of furnaces do you think would be interesting? Comment below and share your ideas!